In this section of the website, you can browse and download ecological and human use maps and data for the Canadian Pacific. The majority of this data was created from 2008–2009, with a few features added and/or updated from 2010–2013. A map of the BCMCA study area with selected features is available as high res 2.8 MB PDF. The Pacific North Coast Integrated Management Area (PNCIMA) initiative’s aim is engaging all interested parties in the collaborative development and implementation of an integrated management plan for PNCIMA. 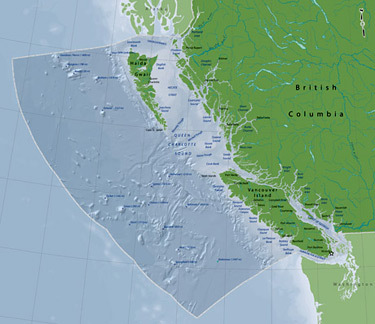 Supporting this effort is a reference atlas (website), complementary to the BCMCA atlas, with 60 themes relevant to the PNCIMA planning process, including communities, ecologically and biologically significant areas, and point source pollution.